Water heaters are an essential piece of equipment found in any residential building, be it commercial or industrial. In essence, they provide warm or temperate water, which is used by people for everyday activities like bathing, washing dishes, washing clothes, cooking, etc. However, as any device, this equipment requires regular maintenance in order to operate efficiently. There have been cases where people with water heaters have gotten relatively dirty or muddy water. The most obvious reason for this is that the tanks are already building a lot of mud or debris. With a lot of this accumulation of dirt and dust particles, the heating equipment may get damaged. Most importantly, your family or the people inside a building dependent on a single unit, could be adversely affected by the quality of the impure water. In this situation, water heating system installation and repair professionals with the right skills could prove to be an immense help. 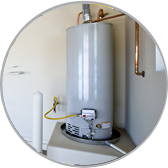 Our Tempe, AZ Water Heater Services also provide you with an installation service as well, which in itself is a solution to a host of problems that a DIY installation cannot prevent from taking place. Our experts are licensed to provide services such as maintenance and repair of water leaks and/or damaged water heating equipment. Plus, they are adept at handling plumbing and sewer repair as well as technical issues such as a faulty thermostat, water control, irregular flashing light, noise reduction, energy consumption, and more. For those of you who still prefer to DIY these plumbing tasks themselves, you may encounter problems such as complications in the systems or damage that may render your device useless. Because of your desire to save money on a hired specialized repairmen, now you're forced to buy a new machine. And we all know its price could put a big dent in your pocket than if you had hired a professional Tempe, AZ Water Heater Services to start with.